David Mostyn is shocked to find his mother Delyth in bed with Dr James Kirkwood, senior partner in the Midsomer Market surgery. Delyth, a beautiful divorcee, is delighted when James uses the occasion to propose to her. Her daughter Megan, James' practice manager, is equally outraged, especially when Delyth tells her they are planning to sell up and travel the world. James also has the difficult task of telling Dorothy Hutton, his late wife's mother, who is still grieving. James asks his partner Alan Delaney to check on Dorothy later, lending him his brand new Range Rover for the journey. But when Alan has to leave the car during a storm, a pick-up truck drives into him at speed and kills him. Barnaby and Jones dig into Alan's past and discover that James once accused him of stealing £30,000 from the practice. But it was put down to clerical error and the two doctors made up. Delyth puts her cottage up for sale as Barnaby brings in computer expert WPC Gail Stephens to trace the missing money. The detectives realise James may have been the real target and race to the surgery just in time to see a bucket of metal bolts thrown off scaffolding, narrowly missing the doctor's head. During a walk with the Midsomer Ramblers, Dorothy confides her suspicions about Megan's lavish lifestyle. She is also worried that Alan helped hasten her daughter's death and James killed him to stop the truth coming out. Meanwhile David points the finger at Clifford Rawnsley, a pig farmer infatuated with Delyth. The detectives travel to Snowdonia to see Bryn Williams, Delyth's friend and co-owner with her of Marchogwr Allt, a disused slate waste pile. They also visit her ex, Huw, a once violent man who recently suffered a stroke. He tells them David also called by, asking him for £250,000 for a business venture. On the way back, WPC Stephens phones. Computer records show Megan used the money to buy cane furniture for David's shop and he shared the proceeds by buying her a sports car. But did they kill Alan or try to kill James? 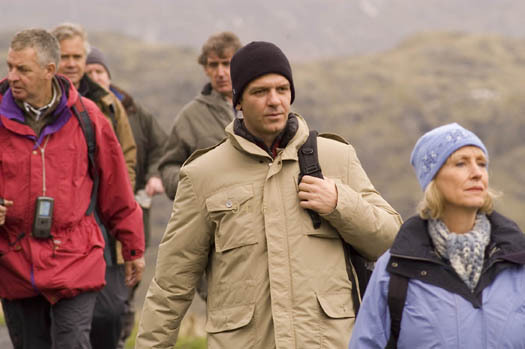 As the Midsomer Ramblers gather in Snowdonia, Jones joins the trek to protect James from potential killers while Barnaby questions David about his financial misdeeds. But something David says makes Barnaby realise James is at risk from a person they never would have suspected &ldots; just as Jones realises the doctor has disappeared from the mountain path.